This roof cooling unit, CUH, with a IP 54 protection degree, provides cooling, either to one enclosure or to a complete assembly, depending on the cooling requirements and desired energy consumption level. It is placed on top of the enclosure and is perfect when there is not enough space on the door or side panels. High performance cooling unit for roof mounting, the air conditioners cover a cooling capacity range from 600 W to 3800 W. Condensation management system, which prevents all condensation from penetrating into the enclosure. All models are equipped with a condensation dissipator, from 1400 W up to 3800 W units. Easy installation, with a quick release mounting frame. Common to all models is the self cleaning condenser coil, which eliminates the necessity for an air filter, avoiding standard maintenance. All models are equipped with digital display. The cooling capacity for specific conditions are indicated in the diagrams. Ozone friendly refrigerant R134a. Roof cooling unit with a IP 54 protection degree. 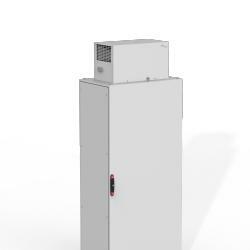 The cooling unit can provides cooling to enclosure's that do not have enough space on the door or side panels whether standalone or as part of an enclosure assembly. Floor standing enclosures can be cooled independently of each other, if required. This avoids cooling the entire enclosure assembly, reducing the amount of energy required, saving unnecessary costs.